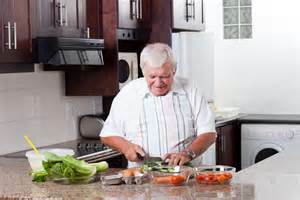 According to the Daily Telegraph this week, men do everyday cooking in a third of UK households. 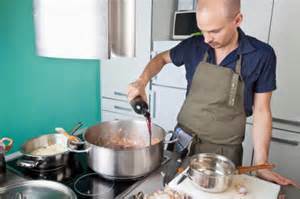 They say that the rise of the male chef is making the kitchen the new shed. And as Father’s Day looms there may be controversy in the kitchen. 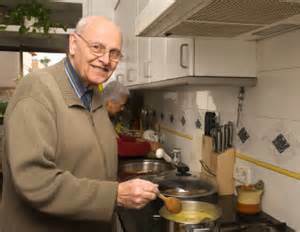 Who will cook lunch this Sunday – Dad? We’re not talking about men whose hobby is to cook the occasional restaurant-quality meal for an audience of friends, or the paleolithic­ dieting throwback whose garden shed exists chiefly as a shelter for his barbecue. This statistic isn’t even about the guy who flaunts his culinary skills (to the implicit denigration of his wife’s or partner’s) by doing dinner-party duty once a week, and leaves stacking the dishwasher to the first hangover­-free person who wakes up in the morning. No, these are the lead cooks in the house, the third of chaps that, a poll for BBC Good Food magazine found, now prepare most of the family meals and the domesticated dads who are taking on the responsibility for teaching our kids to cook. But I'm not one of the 33%. My problem is that my wife is a trained chef and a former BBC Masterchef finalist. Being a professional cook, caterer and recipe writer, she won’t allow me anywhere near the kitchen. My ideas and tastes are just so yesterday, it seems. She doesn’t despise me for a lack of imagination. And yet still so many people find it hard to accept that The Real Food Inspector is not master of the kitchen. According to Penny Lancaster (below), model, photographer, and other-half to Rod Stewart, any man who volunteers to cook some grub in the home is no kind of man at all. “Putting the apron on robs men of their masculinity,” said Lancaster on Loose Women, adding that a man’s role is to be “the hunter gatherer, the macho man, looking after the family”. This claim that cooking makes a bloke less manly overlooks the plain fact that, ever since the institution of the restaurant was founded by Monsieur Boulanger in Paris in 1765 professional kitchens have been dominated by male chefs. It was always seen as masculine work, and the fact that the kitchen has now become the hottest room in the house is simply an extension of that. For many men it has become akin to the new garden shed – a place to retreat to and ponder important thoughts while they get their goat’s cheese soufflé absolutely right. It’s a man-cave where they can keep their tools – the battery recharger has given way to the batterie de cuisine; the lethally edged Japanese knives are in their racks; the heavy-bottomed Le Creuset pots hang on their hooks, the lids neatly stored. Blowtorches let them achieve a perfect crème brûlée; temperature sensors tell them when the gigot of lamb is perfectly pink and when the water-bath is exactly right for our sous-vide salmon; digital scales make postage-stamp portions a doddle; and who could have been faffed to make pesto regularly before there were food processors? OK, most men who get really serious about the kit are hobbyists – in the BBC poll reported in the Daily Telegraph, 36 per cent of the respondents said that the accomplishment that would make them most proud would be the ability to cook like a restaurant chef; and 29 per cent said it actually was their hobby. But 87 per cent take on at least some of the daily cooking at home. Something else that has changed is that about the same number of women as men take charge of the barbecue. So what’s going on? Partly men are just responding to our genes. A look at Yuval Noah Harari’s Sapiens: A Brief History of Humankind will convince you of the primacy of cooking skills and the fact that throughout our history these have been, if not manly virtues, at most gender-blind. But of course there’s also the less agreeable aspect of the revolution in men cooking. It’s become competitive. What else, after all, could account for the popularity of something so intrinsically boring as watching other people cook when you can’t actually smell or taste the food? 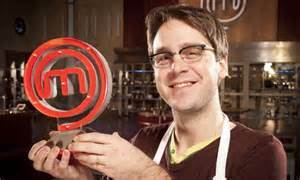 Even my wife on Masterchef had to call upon her inner testosterone to play the game by its arbitrary rules. We know where all this leads, don’t we? Saucepan swagger, man-upmanship – my buffalo mozzarella is better and more expensive than yours; my chocolate has come from a single source plantation in Venezuela etc, etc. And Penny Lancaster says cooking isn’t macho!